Nothing injects life back into The Flash quite like a visit from the cast of Supergirl. The latest crossover episode delivered on all the singing and dancing it promised and, most importantly, reminded everyone that The Flash can be fun (a concept in short supply on CW Tuesday nights this TV season). 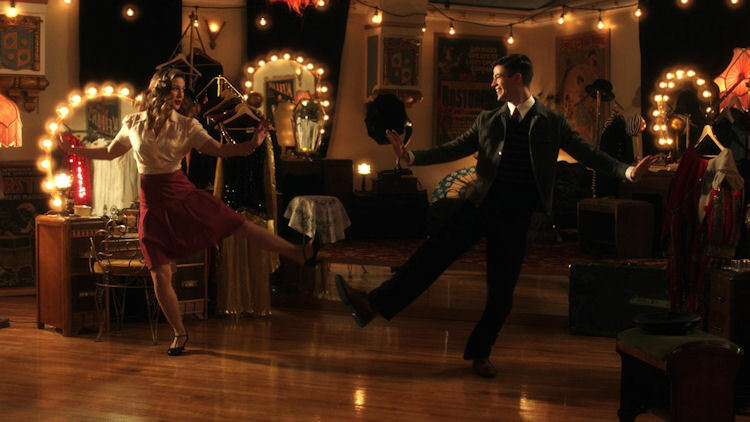 For those who missed the end of Supergirl the previous night, the episode setup was simple: the alien Music Meister has trapped Barry and Kara in a fantasy world of their own making (aww, they both love old movie musicals). All they have to do is follow the script and they’ll make it out, but there’s a catch: they don’t have their powers, and if they die in the dream world, they die in the real one. Kara and Barry play nightclub singers tangled in a battle between gangsters, and the world is populated by movie versions of people in their own lives: Cisco, Winn, Joe, Malcom Merlyn, Dr. Stein and most importantly, Iris and Mon-El, who are in “it’s complicated” relationships with the two heroes. Of course, in the dream world, Iris and Mon-El play star-crossed lovers, and it’s up to Barry and Kara to write a happy ending for them. It wouldn’t be a musical without the songs: a few standards, and a couple of originals thrown in for good measure. Each did their piece in moving the story along. The Henri Mancini classic from Breakfast at Tiffany’s sets the stage after Barry’s arrival in the dream world. Benoist’s voice is strong with just the right touch of breathy for this ballad. With so many TV musical shows trying to turn every song into some kind of R&B powerhouse, it’s nice to hear a well-done traditional interpretation of a standard. As the first big production number of the show, Music Meister (Criss) has just laid the groundwork of what Kara and Barry have to tackle. The song also proves to be an important hint about what the heroes need to do to be successful in their task ahead. For me, Valdes and Jordan stole this number, and even Barry couldn’t resist getting caught up in the infectious melody. The show moves a lot of plot between the second and third songs of the hour. In the real world, Cisco, Wally and Martian Manhunter team up to capture Music Meister, while in dreamland, Kara and Barry convince Iris and Mon-el to tell their parents about their forbidden love and in the process, uncover truths about their own love lives. As for the song itself, while there is some charm to seeing gangsters sing a number from Guys and Dolls, this song wasn’t a great fit, especially when it was the first song after two acts without any music (that point in the show needed more energy). Garber, Martin and Barrowman – they can belt out a tune, so credit where credit is due there. The episode rebounds nicely with its first original of the night, which was co-written by Rachel Bloom of Crazy Ex-Girlfriend and Tom Root of Robot Chicken. The song makes perfect use of the insane chemistry Benoist and Gustin possess, while keeping the charm of an MGM musical intact. The lyrics are full of puns and meta references, and the dance portion of the production is high energy and reminiscent of Royal Wedding. Best song of the night. This is the second original and last song, overall. This one was written by Banj Pasek and Justin Paul, who recently won an Oscar for helping to write La La Land‘s “City of Stars”. Gustin has a John Mayer quality to his voice, which fits this ballad that melts hearts. With Barry and Kara saved by the loves of their lives, and the Music Meister unveiled to be an omnipotent being who just wanted to mend a couple of broken hearts, Barry and Iris retire to the apartment they once shared. The mood just right, Barry kicks the on his phone, serenades his love, and seals the night with a second marriage proposal — but this one comes from a place of love, rather than fear. As I said at the top, this was the most fun episode of The Flash in a long, long time. Part of the credit goes the collection of musical talent already existing in the Berlanti-verse shows on The CW, and the other part is that this episode had practically nothing to do with the depressing Flashpoint storyline. If there was one quibble with the episode, it is that the sound mix felt off. The musical segments were so rich that it was jarring when it switched back to the thinner dialogue track, but that’s a small price to pay for one of the most enjoyable hours of TV this season.